There are a bunch of smaller, secondary perks when you’re a parent. Like, having a valid excuse to buy and eat boxed macaroni and cheese – or swinging on a playground without sideways glances from the other adults (“I’m showing the kid how to pump his legs, geez!”). What I love though is seeing something like a book or a TV show and telling my kids that Mommy used to read/watch that when she was a kid. Their eyes get all big and round, and for a brief few seconds they’re actually speechless. Yesterday marked the 45th anniversary of the publishing of a book that I loved as a preschooler, and both of my kids also currently enjoy. The Very Hungry Caterpillar by Eric Carle was an instant favorite of the early reading crowd and has remained popular all these years later. Yesterday also marked the release of The Very Hungry Caterpillar™ & Friends – an interactive storybook that introduces the critically acclaimed story to a new generation of tech-savvy kiddos. 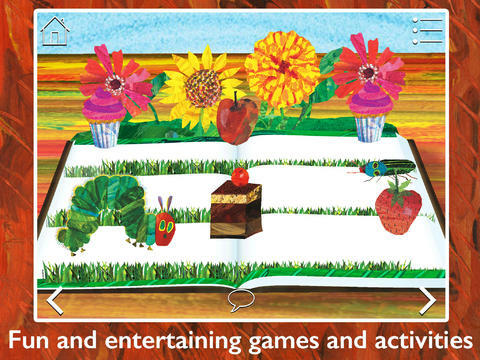 The 3D pop-up format of the digital storybook in this app help to bring texture and dimension to the iPad. There are voice-narrated pages of fun animal and insect facts followed by interactive games that include some of the facts. After each game is played, kiddos earn a badge that symbolizes different in-game achievements. For non-readers there’s an option for autoplay of the book or a voice narration, and older readers can read out loud with no narration. I found the app to be a delight. I loved the caterpillar as a child and now I can see that my kids really enjoy the story too. The facts are kid-friendly and easy to understand and the interactive games present just enough of a challenge to keep them engaged. Not only does the app bring Eric Carle into the lives of 21st century preschoolers, but it teaches important reading skills, promotes problem solving, and boosts little-finger dexterity. Priced specially for the launch at $2.99, The Very Hungry Caterpillar™ & Friends app is a perfect companion to the classic Eric Carle book. It’s pretty awesome to see that the books that shaped my early reading years have been reinvented for my children.